This is another one of those exercises that takes something I used to in class and throws the whole thing online. It is my goal to whittle down in-class lecturing to the point where our class is more like a "hybrid," with more time spent on your own and less time listening to me talk. So, you can read through this material and then answer nine questions in Assignment 15. I've made a video of me talking through the lecture as I normally do it, or you can look below at some text and music links that you can read and click at your own pace. The top video is another large file (240MB) hosted on my web account, so as usual take care when viewing with cellular data. We are going to look at two Russian composers in this unit, who represent two different strategies for artistic success when you find yourself born outside of the "mainstream" of a cultural scene. Modest Mussorgsky, on the other hand, stayed close to home. He has a circle of friends that were obsessed with creating a distinctly Russian brand of art. One could call this a nationalist strategy. Pictures at an Exhibition came about after the tragic, early death of one of Mussorgsky's associates, an artist and designer named Viktor Hartmann. (He died at age 39.) As a sort of celebration and memorial to his life, his friends put on a show of his work, and Mussorgsky was inspired to write a piece based on the event. Mussorgsky's Pictures at an Exhibition debuted in 1874. Let's start by looking at a little bit of Hartmann's work. Much of this is what we would call "design" rather than painting. 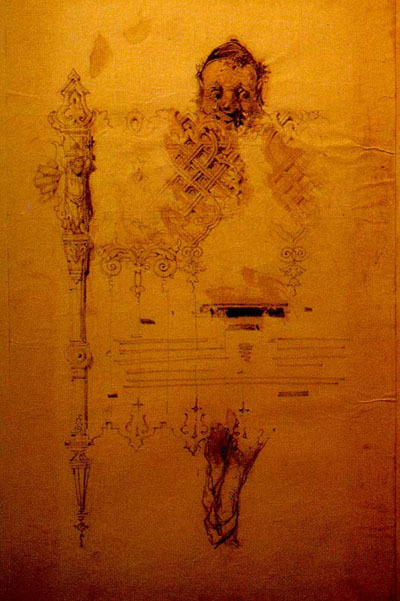 So, for instance, he created this design for a bedpost, which includes a little elf-like figure peeking over the top. This is the "Gnomus." This clock is particulary rooted in Russian folklore, because it is supposed to also be the house of Baba Yaga. I've had some students in class who have explained this to me - Baba Yaga is a witch, and she lives in a house that has these giant chicken legs at the bottom. The house can apparently walk around by itself! 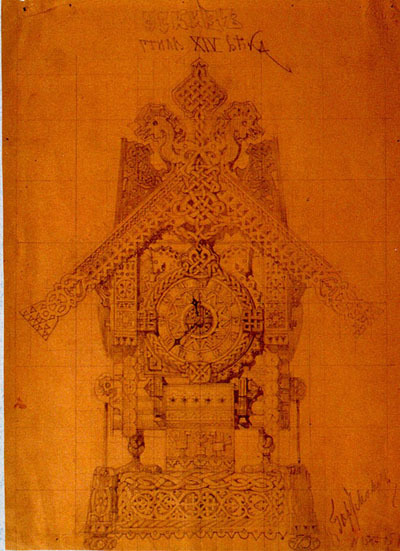 Finally, let's look at Hartmann's design for a gate to the city of Kiev, Ukraine. It was never constructed, so it only exists in this picture. Mussorgsky was so inspired by his friend's work that he turned it into a 40-minute piano piece. It is fairly well known in its original piano version. However, after his death the French composer Maurice Ravel orchestrated Mussorgsky's music, taking the notes and distributing them to a wide variety of instruments. This more vivid and colorful version is even more popular amongst music fans, and it is the version we will study for the quiz. For a while we'll bounce back and forth between the piano version and the orchestral version to appreciate this process of orchestration. The piece opens with very grand and dignified music called the "Promenade." 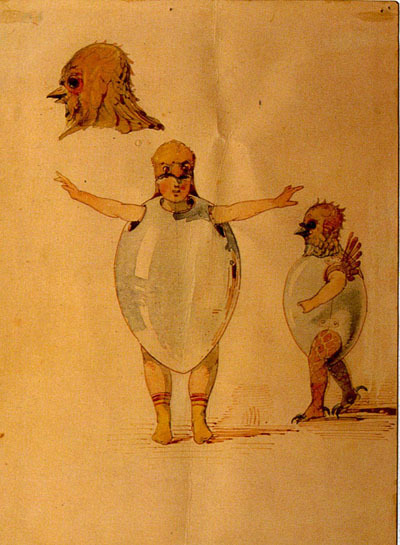 This is supposed to represent everyone arriving at the exhibition and looking around, "seeing and being seen." It also keeps returning throughout the piece to sort of lead us from one picture to the next. "Bydlo" is Polish for "cattle," and here it is used to refer to a cart pulled by an ox. Mussorgsky's music sounds slow, methodical, and a bit weary. Hartmann's original picture of the Bydlo is lost, so in this video clip I substituted a painting by Van Gogh. 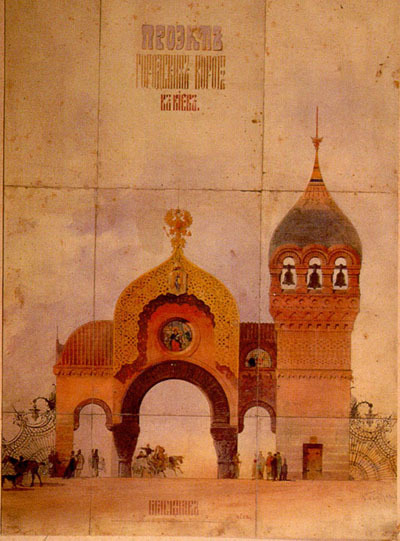 The grand finale represents Hartmann's design for the gate to the city of Kiev. As you might expect, Mussorgsky makes it sound very elaborate and spectacular. I believe this music is frequently used on television for sporting events and whatnot.